Bill Radke: In a moment, I'm going to ask you to give the candidates their ideal brand names, but let's start with the names they've got. How well are they working? Jim Singer: I think some work better than others. I think Barack, the sound of his name -- it's a very powerful name. In the world of phonetics, and this is strictly talking about the sounds of words, there are certain elements that cause a word to be more powerful or less powerful. His happens to be a very strong name. It starts with a plosive, which is a little explosion that you create when you say a "p," a "t" or a "k" sound, or a "b"-that's a labial plosive. That catches the ear of the listener, so the first thing he's got going for him is the puff of air, and the "Ba-rack" which is another plosive, a very strong ending similar to some pharmaceuticals out there such as Prozac. You were part of the team that came up with the name Prozac. How does that process work? We sit around a table and think up good-sounding words, and then we take them apart and try to sell them to the clients afterwards with a lot of science behind it. But really we're just kind of babbling in there, and when a good one comes out, we write it down. You just cut your commission in half with the admission that you're babbling without science. OK, Jim, we asked you earlier this week-so you've had a little time to think about it. If the four front-running presidential candidates were pharmaceuticals, what would you name them? We thought that for Barack, he stands, ostensibly, for change and hope - and came up with Hopium. 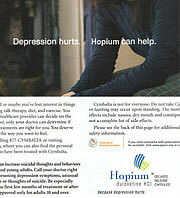 For Barack Obama, his drug is Hopium. Wait a second. Are you sure that's a good idea? Doesn't he have some past recreational drug use? Oh, that's right. And he not only doesn't deny it, he touts it. Well, okay. Not that he's not a strong shot of Hopamine, but I'm just wondering if that's a good idea for him. Hopamine, that's a good one, Bill. McCain, now, he's not only willing to keep our troops in Iraq for as long as it takes, but he'd like to even increase the troop numbers. So we thought his drug name might be Escalatra. And then for Huckabee, we thought, well, he's an evangelical Christian, his drug might be Zelotra, or Zelotene. Of course, you're politically neutral here. Of course, I'm neutral. No bias whatsoever (laughs). No, I don't detect that. Okay, Jim that's excellent. Congratulations to you and your staff. For this kind of a naming project, we charge $50,000, $75,000 and upwards, but this is gratis. Thanks. Consider it your pledge to public radio.